Kitt's World: Thinking of You. Here is a non holiday card. LOL. As the holiday season starts I do think of my friends and family that live far away. It's nice to let them know your thinking of them if you don't talk to them very often. This card is for the challenge over at Give a Crafter a Cookie. Join us and enter the challenge which is inspired by images of cookies. This card actually reminds me of the times my mom and I would have a cup of tea and cookies. She is now gone one year and I still miss her. The images I used are from Robyn's Fetish. I used Spectrum Noir markers and Stickles diamonds. For those of you who follow me must of been wondering if I lost them because its been so long since I posted about them. LOL. 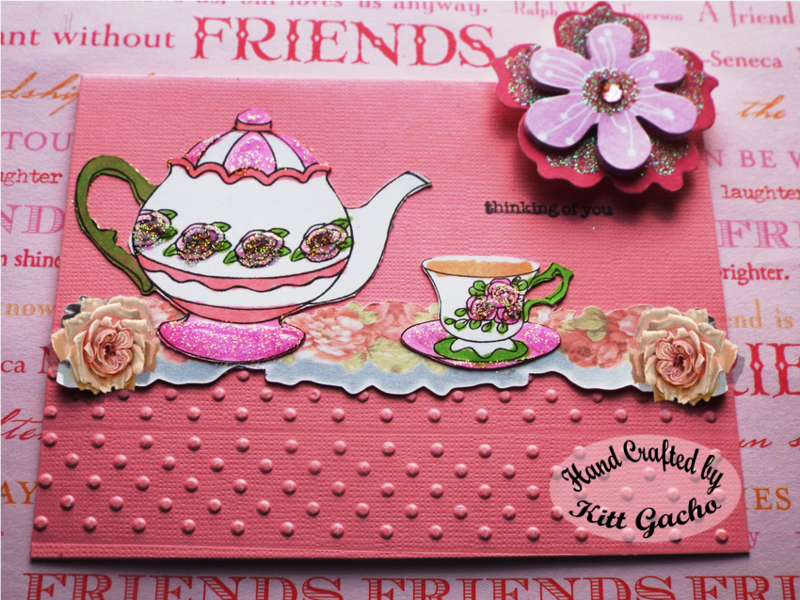 I also embossed the base of the card with Cuttlebug swiss dots embossing folder. The sentiment is a stamp from Stampin up tiny sentiments. The flower above the sentiments is from my stash. Thanks for stopping by today and leaving your comments. I love hearing from you. Stay tuned and follow me as the holiday train will be leaving the station soon. Such a beautiful card Kitt and I am sure your mom is loving it and watching you from haven. Thank you Kitt for playing along with us at DigiStamps4Joy and hope to see you again soon. Have great moments. WOWZERS, this is absolutely GORGEOUS and I love the tea cups/tea pot. You are super talented and created and I'm always delighted to meet new crafters who inspire me, so I will be back by again soon to see more of your art. I just became your newest blog follower, and would greatly appreciate having you stop by my blog to visit and follow my blog when you have the time, It would mean SO much to me. Gorgeous card Kitt. It's so pretty and feminine and I love the added sparkle. What a nice card Kitt! I love the arrangement and colors used. I would be a happy camper if I received this card from a friend. Very nice Kitt! Thx for playing with the crew over at Inspiration Destination's Challenge Blog! Good luck on your entries! Thank you for joining our thankful and thoughtful challenge at Dreamweaver Stencils this month. Your card is darling and of course a very thoughtful creation!